With an all-star roster that Rolling Stones singer Mick Jagger referred to as the biggest collection of old English rockers in history, Wednesday night's 12-12-12 hurricane Sandy benefit. in aid of victims of October's superstorm had plenty of musical treats. But the sight of Kanye West working up a sweat trying to get the classic rock-loving crowd in new York's Madison Square Garden on their feet during an impassioned 20-minute, hit-packed set and Coldplay's Chris Martin dueting with R.E.M. 's Michael Stipe was nothing compared to the night's worst-kept surprise. Amid a set of Beatles and Wings classics, former moptop Paul McCartney made the impossible happen, reuniting the living members of Nirvana for a thrashing rumble through the new song "Cut Me Some Slack," which helped cap the six-plus hour show. Beamed across the globe to a reported potential audience of 2 billion, the benefit filled the Garden less than two months after Sandy devastated the New Jersey shore and brought a destructive wall of water into New York. To help those still struggling to recover, some of the globe's biggest music acts filled the air with songs of hope and recovery, topped by the McCartney hook-up with the Nirvana trio, which Foo Fighters mastermind Dave Grohl immediately tweeted would be the first song from the soundtrack to his upcoming "Sound City" documentary. The evening opened with the muscular rock of Jersey native Bruce Springsteen and the E Street Band playing the brighter tomorrow anthem "Land of Hope and Dreams," which featured the apropos lyrics, "Well tomorrow there'll be sunshine/ And all this darkness past." The Boss' set also featured a gospel-tinged "Jersey Girl" and a duet with fellow Jersey boy Jon Bon Jovi on "Born to Run." Former Pink Floyd mastermind Roger Waters called the shots on muscular runs through such Floyd classics as "In the Flesh?," "Another Brock in the Wall, Part 2," "Money" and "Comfortably Numb" featuring Pearl Jam's Eddie Vedder. New York native Alicia Keys tinkled the ivories for an impassioned "Brand New Me," ending with the fresh coda, "Don't be mad/ It's a brand new time for the city," then segueing into a cellphone waving "No One." She ended by telling the audience, "My city, New York City, is the most incredible city, the most resilient city." Among the guest hosts introducing segments on affected neighborhoods were: Kristen Stewart, Adam Sandler (singing a joke-filled, Sandy-specific remake of Leonard Cohen's "Hallelujah"), Diddy, Chris Rock, Katie Holmes, Jon Stewart, Leonardo DiCaprio, Stephen Colbert, Jimmy Fallon, Blake Lively, Jake Gyllenhaal, Steve Buscemi and Chelsea Clinton. Providing some much-needed 21st century flavor, West pulled out a 20-minute barrage of hits, from new ones like "Clique" and "Mercy" to chestnuts including "Jesus Walks," "All of the Lights," "Gold Digger" and "Runaway." He was followed by Coldplay's Chris Martin going solo, working his acoustic guitar for an urgent "Viva La Vida" and lamenting that he couldn't get "Gangnam Style" sensation Psy to join him on stage. "I know you really wanted One Direction, but it's way past their bedtime," he joked, by way of introducing R.E.M. singer Michael Stipe, who pitched in on a duet on his band's "Losing My Religion," before Martin ended his set on piano with a subdued "Us Against the World." Bon Jovi returned to rock with his band on their hits "It's My Life," "Wanted Dead or Alive" and "Livin' on a Prayer," returning the favor by hauling out Springsteen for the keep-Jersey-in-your-heart anthem "Who Says You Can't Go Home." Eric Clapton served up some acoustic blues on "Nobody Knows You When You're Down and Out" and a plugged-in "Crossroads," the Rolling Stones ripped up "Jumpin' Jack Flash," and, in the longest set of the night, the Who windmilled through "Who Are You," "Pinball Wizard" and a thundering "Baba O'Riley." Long Island's own Billy Joel set up behind his grand piano for "Movin' Out," "New York State of Mind" and "Have Yourself a Merry Little Christmas." 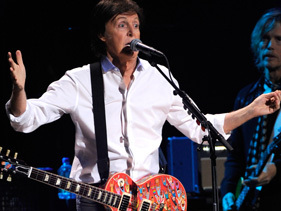 McCartney inhabited his usual closer spot, plucking his bass on a chaotic "Helter Skelter," then slowing it down for Wings' "Let Me Roll It" and an acoustic ramble through "Blackbird." "Recently, some guys asked me to go and jam with them ... so I showed up, ready to jam ... and in the middle of it these guys kept saying, 'we haven't played together for years,'" he said, by way of announcing the whispered-about onstage Nirvana reunion. With Grohl on drums alongside bassist Krist Novoselic and guitarist Pat Smear, performing on stage together for the first time in nearly 20 years, McCartney debuted the sludgy rocker the group wrote together for Grohl's upcoming film about the legendary Los Angeles recording studio. "Mama, let me down," McCartney squealed, strumming his amplified cigar box guitar as Grohl bashed away behind him and Novoselic provided his signature low-end thrum for a song that was 90 percent Nirvana gut-punching chaos and 10 percent Fab harmony. "Mama, watch me run/ Oh mama I just want to have some fun ... set me free, set me free, set me free" McCartney wailed as the song chugged to a climax. The night ended with a firework-filled "Live and Let Die" and an encore performance from Keys playing "Empire State of Mind Part II" amid a sea of first responders.